Sri Lanka Dictates “Either you agree with us or we will slander you as well”. Currently, Sri Lanka is extremely frustrated about the UN investigation. Using 3rd grade tactics the usual slanders are being directed against ex-High Commissioner for Human Rights – HCHR, Ms Navanethem Pillay. Sri Lanka should understand the fact that international law is not like the present judiciary in Sri Lanka. Whether the HCHR is Louis Arbour, Navanethem Pillay or Prince Zeid Ra’ad Zeid Al-Hussein, she or he will not work on the basis of their own ethnic identity. These human rights VVIPs look at every global situation through the lens of international law. Louis Arbour was the first UN HCHR to bring Sri Lanka’s human rights violations to the attention of the international community. For this reason, Sri Lanka slandered her. Then it was Navanethem Pillay’s turn. Maybe later Prince Zeid Ra’ad Zeid Al-Hussein will face the same insults. Sri Lankan officials are looking for venues where they can butter up the new HCHR. In fact they did the same with Navanethem Pillay. 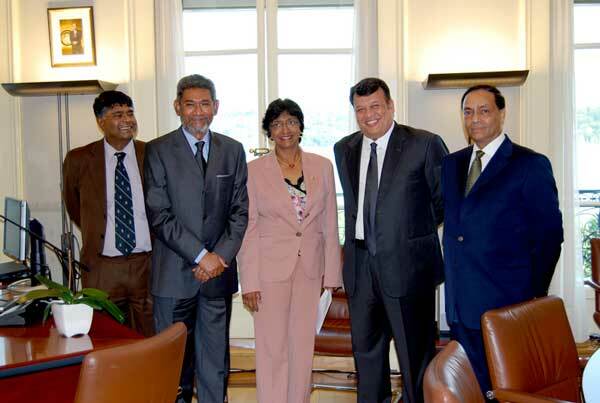 When she assumed her duties on 1st September 2008, Sri Lanka government representatives were the very first government team to meet her – within four days in office on 5th September 2008. They took photographs for their publicity. But her adherence to the standards of international law ensured that Navanethem Pillay never got caught to their buttering up. She never ignored the human rights violations, crimes against humanity and the genocide continuing in Sri Lanka. On 1st September 2014, the Sri Lankan government spokesman Keheliya Rambukwella told reporters: “Pillay was biased and made some unfair decisions on Sri Lanka and the Government hopes her replacement will take note of her actions and be fair in his decision. He also said that “the Government will deal with the new UN High Commissioner for Human Rights while the External Affairs Ministry will decide if he should be invited to Sri Lanka.” Whatever the Sri Lankan spokesman says, civil society expected Sri Lankan government representatives to meet the new High Commissioner, to brief him about their dirty work. “Either you agree with us or we will slander you as well”. Sri Lanka howled that Navanethem Pillay was “biased and made some unfair decisions”! If that were the case, the UN Secretary General, the UN General Assembly, the UN Security Council and also the UN Human Rights Council all exist to supervise and if she had done anything wrong, they would have taken action. So it is obvious that Sri Lanka is telling tales. Not only Navanethem Pillay, but many other examples too, prove that when any VVIP doesn’t agree with, or support, Sri Lankan government atrocities and behaviour, they get slandered. Heads of Sri Lanka Monitoring Mission – SLMM, Major General (retired) Trond Furuhovde, Major General (Retd.) Tryggve Tellefsen, Mr Hagrup Haukland, Major General Ulf Henricsson, Major General Lars Johan Solvberg, other members of the SLMM and many others. Sri Lankan officials and ambassadors live like “frogs in a well”. The new HCHR is not going to work only on Sri Lanka. His responsibilities encompass the promotion and protection of human rights globally. However Sri Lanka clearly does not understand or does not want to concede that the business of passing a resolution in the UN Human Rights Council was the task of UN member states. It has nothing to do with neither HCHR Navanethem Pillay nor any other UN Officials. There is much evidence to prove that the Sri Lanka government is attempting to dictate to the new HCHR, that he must work in their favour! It is well known that otherwise, his name will also be included in the list of those slandered. The mouthpiece of the Sri Lankan government, the “Sunday Observer”, said the following about the new UN HCHR. “I am supremely confident that I speak with moral authority,” the High Commissioner said. A farewell was organised for Navanethem Pillay by NGOs in Geneva on 5th August. Some Tamils attending this farewell from Paris were well manipulated by Rajapaksa’s government through Douglas Devananda’s agents in Europe. News about this farewell was first published in the most racist Sinhala print media, published by the Upali group. The Rajapaksas’ supporter – a Sinhala racist and some Singhalese drivers working for various embassies in Geneva were behind this news item. Last March, while this Sinhala racist and his friends, some Singhalese drivers, were walking towards the Press club in Geneva, without realizing to whom they were talking, they told a VVIP that ‘Tamils in Sri Lanka are from India, now is the right time for them to move to Tamil Nadu’. I thank the Dwarf and his friends for this big favour. What they said was well recorded and has gone into the right system, acknowledged as part of the thinking of the extreme Singhalese.